I'm a Dan Brown novice. I avoided his novels and the film version of The Da Vinci Code. I suspected that they were overhyped trash. And that the controversy over their Catholic Church bashing was simply more rubber for the popularity tyre fire. So I viewed Angels and Demons, the movie sequel based on Brown's prequel novel, with low expectations. I was surprised. I spent the next two hours thoroughly entertained by this thriller. Angels and Demons is a live-action cartoon, offering a few laughs, a few thrills, and nary a demand to use one's brain. It is trash, but boy, what fun! 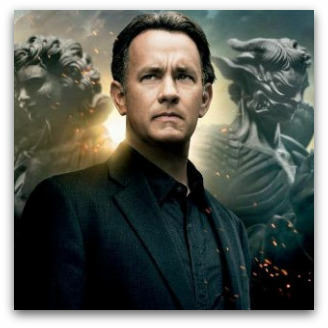 Symbologist Robert Langdon (Hanks), having, in The Da Vinci Code, attempted to uncover a conspiracy at the foundations of the Church, is now called to the Church's aid. It seems the Illuminati, an ancient brotherhood of scientists and artists with a beef against the hierarchy, has reemerged to execute their counterpunch. This consists of a methodical act of terrorism designed to hobble the Church at its hub. The Church is, meanwhile, in a state of stasis; the Pope has died, and the Cardinals are in Conclave, enacting the rituals that will lead to the election of a new Pope. The threat has arrived while they are at their most vulnerable. Now they depend upon Langdon, previously their nemesis, to be their saviour. Langdon, an Illuminati expert, is also a hero from the same mold as Indiana Jones (sans wise-cracks and whip). He's an academic with a dash of derring-do. He scoots around the streets of Vatican City, an agnostic on a mission from God, ever in physical danger as he follows the clues and tries to solve the puzzle laid before him. Just as the camera devours the authentic scenery, so too does the script dip and taste from Church history and religious art — the origins of the Illuminati, its fractious relationship with the Church and, pertinently, the works of the sculptor Bernini. Obscure references and the minutiae of Catholic ceremony are laid bare for the layman. If you had to pick a word to describe Hanks, 'likeable' might be it. In that respect, his casting as Langdon is perfect. Even those who thought The Da Vinci Code was sacrilege of a deadly variety surely couldn't maintain their disdain with Forrest Gump in the lead role. While Hanks cruises on his natural affability, McGregor has a ball as the gentle but vaguely off-kilter Camerlengo McKenna, the man responsible for keeping the papal seat warm while the Cardinals are in Conclave. Whether McKenna is a hero or a villain is not always clear, but he is responsible for delivering a key monologue, which extrapolates the film's science vs religion theme. It's heavy-handed, but McGregor, enjoying himself, pulls it off. Other characters, such as exotic scientist and Langdon's de facto sidekick, Vittoria Vetra (Zurer), and the sneering Commander Richter (Skarsgård), leader of the Vatican's elite Swiss Guard soldiers, play perfunctory roles without any attempt at character development. Two-dimensional? Sure, but this is a cartoon after all. Most viewers will be able to enjoy it with their mind functioning at only 15 per cent. I'll try not to give too much away. Suffice it to say that the film has two endings. The first is a cracker. It involves an act of individual self-sacrifice; the ultimate gesture of common humanity, which transcends ideological battles between science and religion. It's neat, and justifies much of the silliness that has preceeded it. Then comes the twist. It's flagged by the sight of a parachute tumbling from the sky. With it tumbles credibility. Brown (and the filmmakers) can't resist a good Church conspiracy, and the twist ending directs the finger-pointing back inside the walls of the Church. This will not just annoy religious folk. As an ending, it's plain dumb. As usual with "the universal church" these days, it all depends which side of the fence you straddle. I like Tom Hanks; all I have now is a headache after reading your convoluted article! Enjoyed your take on Angels and Demons. I think as a no-brainer it works fairly well and has some genuine moments of tension. I think Richard Leonard has taken the thing a tad seriously/defensively. Of the two films (recognising Richard's point about the choice to stuff up chronology/sequencing of the characters and the tales - only Dan Brown fans, of which I am not one, will give a toss) I thought this was a better film than DVC; mostly because of the humungous backlog of information DVC forced into dialogue and the really irritating visual schematics they deployed. Nice review Tim, as I recommended you disengaged the intellect and have enjoyed the film for what it is - a silly way to while away two hours. Nicely done! Having seen and also (rather surprisingly) enjoyed the film, I think your review nails the movie's strengths and weaknesses, esp with regard to the predictable and vaguely disappointing ending. Ewan Macgregor was worth the price of a ticket alone. I would suggest Mr Kroenert read the books then make a comment. Both of Browns's stories are just that - stories. It's about time people took themselves less seriously and became less condescending. The movie is a piece of fiction, that's all!! I'll be interested to see what you think of Gomorrah.